I don’t know anything better on a hot summer day than a cool slushy popsicle. 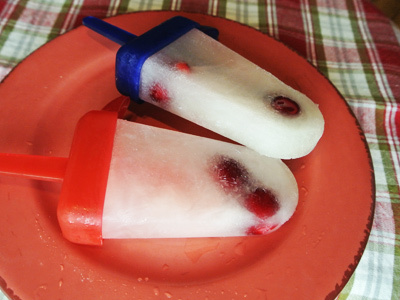 Making your own popsicles are fun because you can try so many different flavor combinations and add any kind of fruit. In the old days we used to make popsicles with Kool Aid and sometimes add Jello. It was all about keeping it simple, inexpensive, fun to make and fun to eat. I’ve kept those same qualities with these popsicles. I find them to be the most luscious frozen treats that taste like hand held frozen margaritas using only a single can of frozen limeade or lemonade, a few berries and a little pre-made margarita mix. So simple yet so tasty. For a kid friendly version, leave out the alcohol. 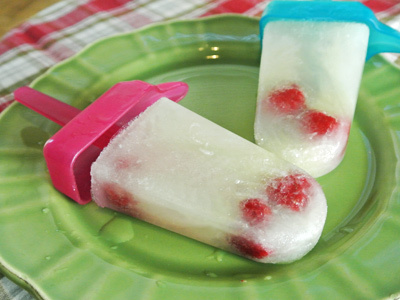 Kids will love the frozen berries tucked inside their frozen limeade or lemonade. 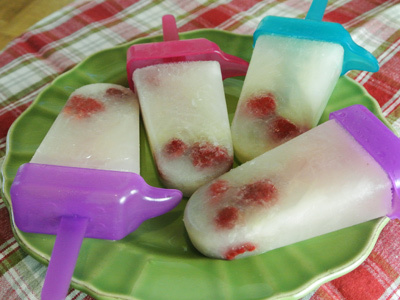 Version #1 Limeade Margarita Popsicles with Raspberries. 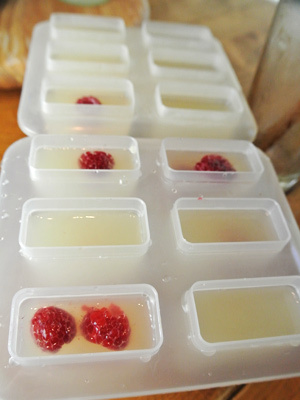 You’ll need 1 can of frozen limeade concentrate, 1 can of water and one half pint of raspberries. Skinnygirl Margarita mix is optional but it tastes so good! What do you think of my roses, they brighten up a table don’t they? 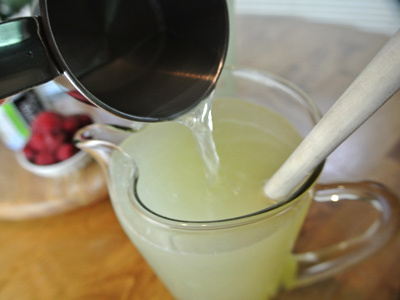 Empty the can of frozen limeade concentrate into a pitcher, preferably with a skinny spout. Add 1 can of cold water and 1/2 cup of pre-made Margarita mix. Mix until all the frozen limeade is completely mixed in. 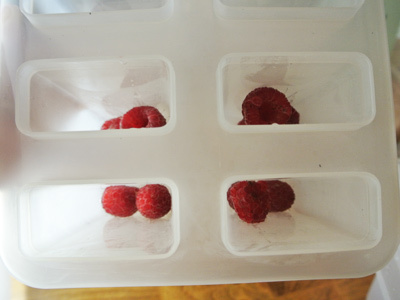 Drop 2 – 3 fresh raspberries in each popsicle mold. Pour the limeade margarita mix to the fill line of 12 popsicle molds. Some raspberries will float to the top, others will stick to the bottom or stay in the center. Add the tops securely and freeze . The next day you will have a slushy citrusy treat. Version #2 is Limeade with Sweet Cherries! Remove the pits first . . .
Or maybe you would like Version #3 Blackberry Lemonade to tempt your taste buds! There are many combinations, what’s your favorite? 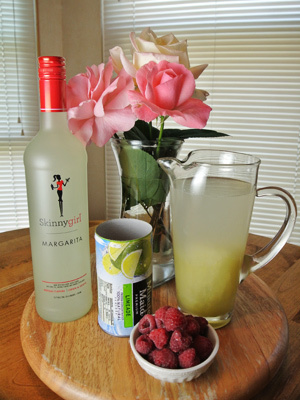 1/2 cup Skinnygirl Margarita Mix or your favorite pre-made mix. Combine frozen limeade or lemonade concentrate with 1 can of cold water. Stir until the frozen concentrate has dissolved then add the Margarita Mix. 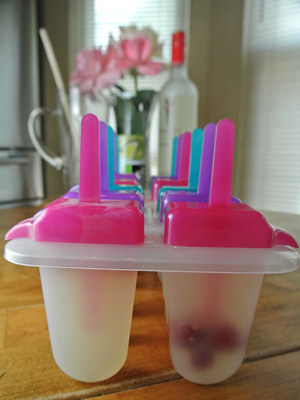 Drop 2 – 3 berries in each popsicle mold, then pour the Limeade/Lemonade mix to the fill line. Place the tops securely and freeze approximately 8 hours to overnight. Rinse mold under warm water 10 – 15 seconds for easy removal. Enjoy! Oh what a fabulous idea! 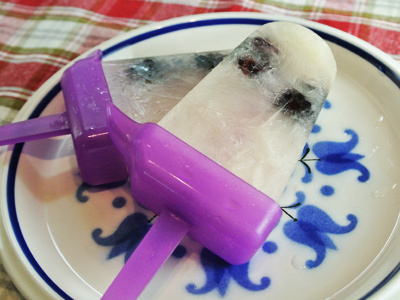 Love the fresh fruit frozen inside the popsicles, Jan! Thank you Roz! I’ve been having fun playing around with different fruit combinations. They are a cool treat for my husband and I now that we don’t have any kids around!